Research has demonstrated that academic assessment is crucial for all, although there is limited information on academic assessment for learners with autism. 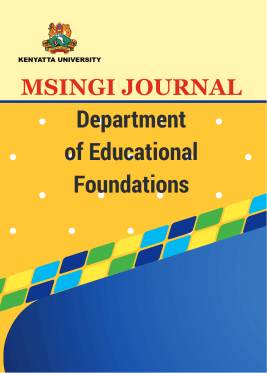 The purpose of this study was to establish the views of teachers towards academic assessment for learners with autism at City Primary School in Nairobi County. The study adopted a qualitative paradigm with a case study approach where social constructivists’ epistemology was applied. Respondents were twenty, comprising of; one head teacher, one deputy head teacher, six teachers for special needs education and twelve teachers from the regular program but teaching in the inclusive class rooms. Non-probability sampling technique specifically using; unique case, snowball and convenient sampling techniques were used to select participants in the study. Data were collected through interview guides and focus group discussion guide. The data collected were transcribed and analysed qualitatively through open, axial and selective coding. Data were also categorized in relation to research questions of the study. The analysis involved developing a coding system based on samples of collected data and classifying major issues or themes that emerged. All the coded information was put together for summarization of the report. From the findings, two types of academic assessments were identified namely; authentic and standardized academic assessments. The findings also showed that teachers faced challenges when assessing learners with autism. Some of these challenges included; large amount of content in examinations, lack of policy guidelines for examining learners with autism and high parental expectation. The solutions to these challenges were that, teachers, government and parents had a role to play to enhance assessment of learners with autism.